Joe Payne proved that anything is possible in football. 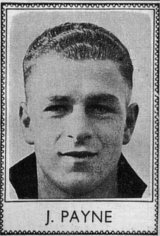 A Luton Town player he had been loaned out to non-leaguers Biggleswade Town, made a couple of League appearances for The Hatters in 1934/35 and four more at the start of the 1935/36 season, all at wing-half. Seven months after his last Football League appearance injury problems saw him selected as centre-forward when Bristol Rovers visited Luton in a Football League Division 3 South fixture on Easter Monday 1936 - April 13th. He scored his first League goal, it was a hat-trick by half time and by the time the final whistle had blown he had scored 10 - the only person ever to score 10 in a Football League match and breaking the record of nine which had only been set the previous Boxing Day (Bunny Bell scores 9). 'Ten Goal Payne' as he was then known, couldn't stop scoring after that. In all he scored 83 times in 72 appearances for Luton and played once for England (scoring twice) before moving to Chelsea for just £2000 in 1938. A short spell with West Ham followed but sadly a promising career was interrupted by the war and ended prematurely due to injury problems. But surely no-one will take that record from him. I'm sure we all remember 'that' goal in England's 2-0 defeat in Croatia on Wednesday 11th October 2006. In the 69th minute of the Euro 2008 qualifier a harmless enough back-pass from Gary Neville hit a divot, bounced up, goalkeeper Paul Robinson kicked air and the ball just continued its progress uninterrupted into the back of the net. The incident just summed up all our frustrations with England at the time (sounds familiar!) with the 2-0 defeat keeping England out of the top two in the group and giving them the summer off when the finals were played. The first goal scored in the Premier League was by Sheffield United's Brian Deane against Manchester United five minutes after the new competition had kicked-off on Saturday August 15th 1992. The 10,000th Premier League goal was scored by Tottenham's Les Ferdinand against Fulham on Saturday 15th December 2001. To celebrate that landmark Ferdinand received a £10,000 cheque to donate to a charity of his choice and ten years later Marc Albrighton received a £20,000 charity cheque when scoring the 20,000th Premier League goal. His goal was for Aston Villa against Arsenal on Wednesday 21st December 2011. The first club to score 1,000 Premier League goals were perhaps not unsurprisingly Manchester United. Cristiano Ronaldo scored their 1,000th in the 4-1 defeat at Middlesbrough on Saturday 29th October 2005. The first club to conceded 1,000 Premier League goals were Spurs. It was scored at White Hart Lane on Saturday 14th January 2012 by Wolves' Steven Fletcher in a 1-1 draw. The first club to score a century of goals in a Premier League season has was Chelsea who scored 103 goals in their 2009/10 title-winning campaign. The first time a club has conceded three figures in the Premier League was in 1993/94 when Swindon Town let in 100 goals in their one and only Premier League season. Thats 29 goals in 12 League matches - and in the next match he scored another goal in an FA Cup tie against Leicester City! 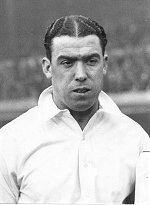 William Ralph Dean - Dixie Dean - scored an amazing 349 goals in his 399 League appearances for Everton. 60 of those goals came in the 1927/28 season which is a League goalscoring record which surely will never be beaten. But he left it late needing to score seven goals in the last two matches. Dixie's League goals in1927/28. The most dramatic increase in goals scored in the Football League took place in the 1925/26 season due to a change in the offside law. Prior to that season defending players had almost perfected the offside trap - Bill McCracken and Frank Hudspeth of Newcastle being the masters - leading to many stoppages for offside and play being compressed into a narrow space either side of the halfway line. Goals and attendances were down and football had started to become boring. The FA had two possible solutions to the problem - to reduced from three to two the number of defending players needed to be in advance of the attacking player for him to be offside or to add a line in each half 40 yards from the goal behind which a player could not be offside. Trial exhibition matches were played and the FA decided on the first option which was recommended to the International Board and adopted for the start of the 1925/26 season. The changed was dramatic with 6373 League goals being scored in the 1925/26 season compared with 4700 in the previous season - an increase of over a third. And there were some amazing results. In Division 1 (goals up from 1192 in 1924/25 to 1703) Aston Villa beat Burnley 10-0 on the opening day of the season. Sheffield United had home victories of 11-2 over Cardiff and 8-3 against Manchester City but lost 4-7 at Bury and 1-6 at Sunderland. In addition to that defeat Manchester City also lost 5-6 at Bury but won 6-1 at Manchester United and at home had their own 8-3 victory against Burnley, beat Leicester 5-1 but lost 1-5 to Huddersfield! In Division 2 (goals up from 1068 to 1487) Darlington at home beat Portsmouth 7-1, Clapton Orient 6-0 and Sheffield Wednesday 5-1 but away from home lost 2-5 at Chelsea and 1-6 at both Port Vale and Stoke. Apart from that victory over Darlington, Stoke also beat Fulham 5-0 at home but away lost 1-5 at both South Shields and Wolves, 2-7 at Oldham and 3-7 at Derby. In Division 3 (North) goals were up from 1320 to 1628. At home Hartlepools beat Walsall 9-3, New Brighton 6-1, Accrington 5-1 and both Southport and Wrexham 5-0 but away lost 0-6 at Rochdale and 2-5 at Chesterfield, Coventry and Nelson! Doncaster beat Accrington 6-2, Coventry 8-1 and Southport 6-1 at home but away lost 1-6 at Ashington and 3-5 at Nelson. In Division 3 (South) goals increased from 1120 to 1555. 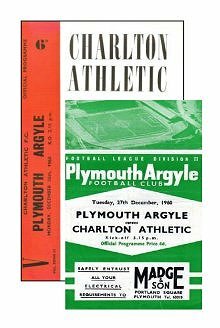 In home matches Plymouth beat Aberdare 7-2, Bournemouth 7-2, Crystal Palace 6-2, Norwich 6-3 and Southend 6-2 while away they beat Charlton 5-0, drew with Crystal Palace 5-5 and lost 1-6 at Aberdare! Manchester City suffered the same sort of problem when being knocked out of the FA Cup by Sheffield United at Bramall Lane on Sunday January 27th 2008. This time the culprits were blue and white balloons released into the Manchester City penalty area by City fans. An early cross into the City penalty area saw the ball hit a couple of balloons before nutmegging Michael Ball and leaving a straightforward goal for Luton Shelton. If being knocked out of the cup by a balloon was bad enough when the City players got back to the dressing room they found that thieves had made off with £2000 of their cash! 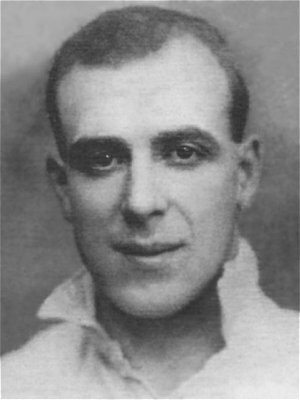 The record for most Football League goals in a career belongs to Arthur Rowley. In a career that spanned 1946 to 1965 he scored 434 League goals in 619 matches for West Bromwich Albion, Fulham, Leicester City and Shrewsbury Town. His 44 Division 2 goals for Leicester in 1956/57 and 38 Division 4 goals for Shrewsbury in 1958/59 still stand as club record highs in a single season. On 12th August 1995, the opening day of the new League season, two goalkeepers scored goals – Chris MacKenzie (for Hereford v Barnet in Division 3) from an 80-yard downfield punt and Roger Freestone (for Swansea v Shrewsbury in Division 2) from the penalty spot. Division 1 runners-up Aston Villa scored a top flight record of 128 goals in 1930/31 while champions Arsenal scored one goal fewer. Villa's Tom 'Pongo' Waring (right) scored in 30 of the 39 League matches he played in that season, his 50 League goals included two four-goal hauls in the first three matches of the season. Also in 1930/31 Blackpool conceded a top-flight record 125 League goals - but they weren't relegated - 1930/31 Division 1 table and results. When Ahn Jung-Hwan scored a golden goal for South Korea which took his country to the quarter-finals of the 2002 World Cup and eliminated Italy from the competition he became an overnight hero. But not in Italy. Sadly for Ahn he was at the time employed by Perugia in Italy's Serie A - but not for long. He was sacked by Perugia president Luciano Gaucci who said "I have no intention of paying a salary to someone who has ruined Italian soccer." that there was a diplomatic incident when Bobby Moore was arrested in South America in 1970 on a theft charge just before England defended the World Cup.